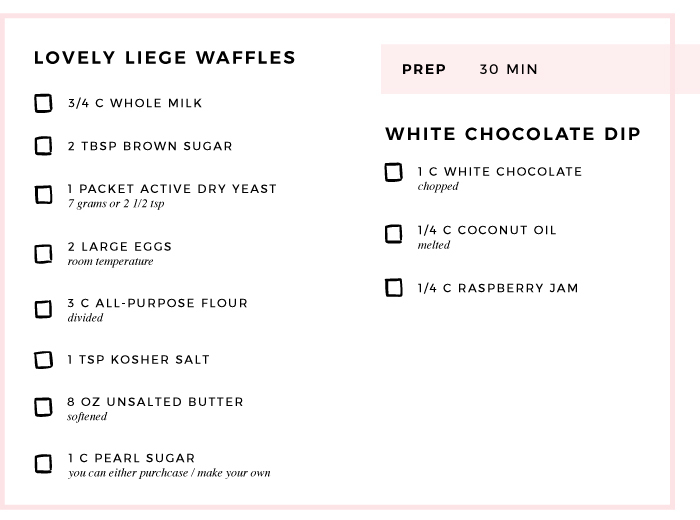 Valentine’s Day is coming up, and we’re thinking these waffles by our friend Claire Thomas of The Kitchy Kitchen will be a delicious, mouthwatering morning treat! 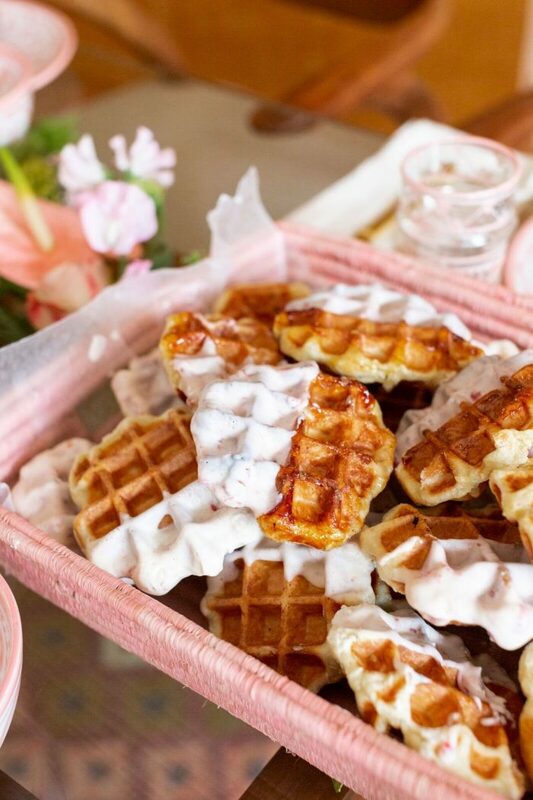 Make these homemade waffles on a cozy weekend morning and top with white chocolate and raspberry jam. Warm milk to lukewarm temperature (between 110 and 116°F). Place mixture in the bottom of a large mixer bowl. Add sugar and yeast and stir to combine. Set aside for 5 minutes; the yeast should look foamy. Whisk in eggs. Then stir in everything but 1 cup flour (you can eyeball this) using a spoon or the dough hook of a stand mixer. Add the salt and mix to combine. Using the dough hook of a stand mixer, add the butter, a spoonful at a time, thoroughly kneading in each addition and scraping down the bowl as needed before adding the next until all of the butter has been mixed in. It takes a while but is worth it! Add remaining flour and knead with dough hook on low speed for 5 minutes, or until glossy. Cover bowl with plastic wrap and leave at room temperature for 2 hours; dough should double. Stir with a spoon or spatula to deflate into a mound, re-cover with plastic wrap and let chill in the fridge overnight, or up to 24 hours. It needs time to rise because of the high fat in the dough weighing it down. When you’re ready to make the waffles, knead in the pearl sugar. It’s going to seem like way too much for the dough, but it will taste perfect once cooked. Divide dough into 12 mounds. If they start looking greasy, return to the fridge to chill. Heat your waffle iron (Belgian works best) over medium heat. No need to oil or butter if it’s nonstick — there’s plenty of fat in the dough. Place first ball of waffle dough on grid and cook according to waffle maker instructions. Cook until deeply golden all over, which will take approximately 5 minutes, then carefully transfer with tongs or a fork to a cooling rack. Remember, they’re loaded with molten sugar; they’re very hot. Repeat with remaining balls of dough, adjusting temperature of waffle iron as needed to get the color you want. You’ll likely find that the waffles look more caramelized and glossy as you go on, as bits of melted sugar stay behind and gloss the next waffles; this is the best part. Rewarm them in the oven or microwave just before dipping, drizzling, and serving. To prepare the white chocolate dip, melt the white chocolate in a glass bowl (microwave or a double boiler works great!). Stir in the melted coconut oil — it should be shiny and saucy. Swirl in the raspberry jam. You can either serve the sauce with the waffles, drizzle it on top, or dip the ends of the waffles in. Finally, you are finished! 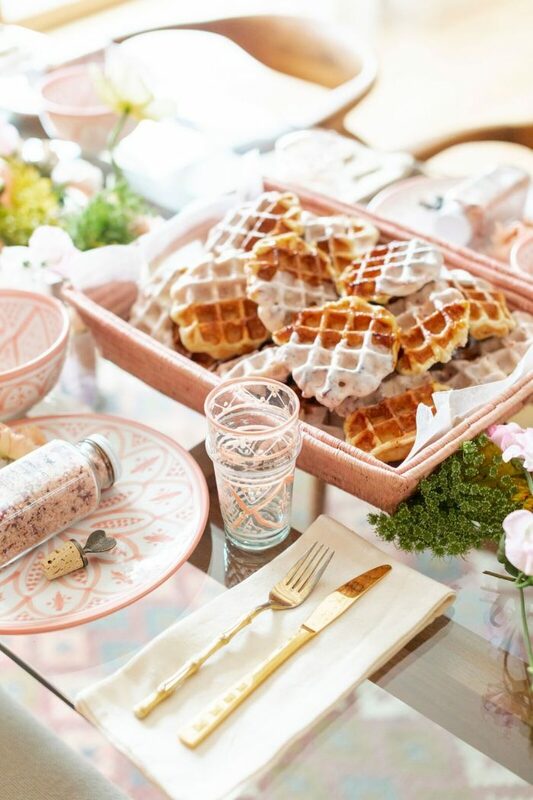 Enjoy these delectable waffles for a sweet breakfast or a special dessert. See here for more recipes by Claire. To recreate this look, visit our Galentine’s Day-inspired collection.